Arguing we have monetized health care delivery beyond recognition or that we have moreover medical commerce posing as health care, is not a difficult argument to make. Beyond ongoing efforts to sabotage coverage expansion under the Affordable Care Act (ACA) and the still unaddressed opioid epidemic (annual drug overdose deaths now roughly approximate the total number of US military fatalities over the 16 years we were involved in Vietnam), there are still over one-in-ten Americans without health care coverage, our country is without a long term care policy, integrating social service supports and dental care for the elderly are either completely, or largely, ignored, we care for a large number of the mentally ill by torturing them (see my THCB February 7 blog post), we have made at best nominal progress in reducing medical errors and/or in measuring quality improvement, we appear to have no interest in correlating quality and spending; and, because health care is so inefficiently delivered we are forced to pay unnecessarily an additional $1 trillion annually causing us to both drown in medical debt and ironically forgo necessary care. Over the first two-thirds of her work, Dr. Rosenthal explains how the health care “industry” is designed such that “at every point there’s a way to make money,” or where “everything is monetized to the maximum, without much regard for the implications for patient health.” She does this using a ten rule framework. Rosenthal’s rules include: more and more expensive treatment is always better; there is no free choice; there are no economies of scale and no competition; there are no fixed prices nor price transparency; no billing standards; and, prices are whatever the market will bear. Rosenthal illustrates these rules via a long list of examples, many, if not most, of these will be familiar to the THCB reader. 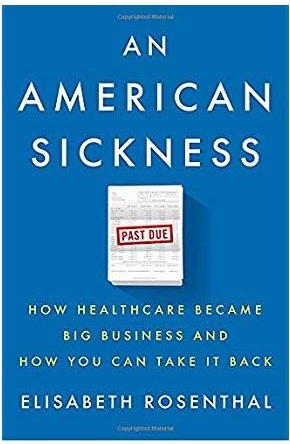 These include for example, service overuse, risk adjustment coding creep or upcoding, exploitation of medical residents, obscene pharmaceutical and medical device marketing and pricing practices, billing practices, physician entrepreneurialism, hospital consolidation, and profiteering by not-for-profit medical societies, “hospital conglomerates,” charitable foundations and venture philanthropists. The relevance of Rosenthal’s work, particularly in light of Haque’s criticism (and similar criticisms by Benjamin R. Barber, among others), forces one to question how perverse or morally bereft the just concluded seven-month debate over repealing the ACA has been and more productively forces us to wonder how going forward health policy reform should be debated. Health care is not, cannot, simply be a cost or a tax paid at the expense of profit taking but instead be a public good, something that protects us, uplifts us, civilizes us, allows us dignity. This is the root of the problem. Healthcare requires core structural reforms and broad anti-trust action at every level of delivery. Instead we spin our wheels in place fumbling around with financial engineering.